It’s been announced by Apple today that their profits have risen to $10.2 billion in the first quarter of 2014. 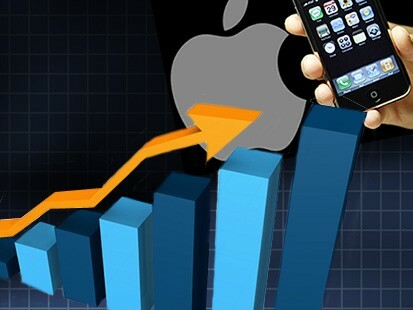 The rise has been attributed to selling nearly 44 million iphones during this period, generating a turnover of over $45 billion. These figures smash the industry predictions of it’s profits and of the number of units sold which was forecast to be 38 million iphones, in what is traditionally a slower period of sales after the Christmas period. In line with these profits, the company also announced some head-turning decisions. They will buy back an additional $30 billion worth of stock from it’s shareholders, issue a total of $130 billion to shareholders and for the first time in almost a decade, will split it’s stock in a bid to make it more appealing to would-be investors. Their own forecast for the current quarter includes figures which are down on last quarter, anticipating revenue of $37 billion. They still continue to expand and have even more plans in the future to take over smaller companies at their consistent rate of over 1 per month for nearly 2 years. The figures are seen by market industry analysts as an extremely positive sign for Apple, with the ongoing power struggle with primary rival Samsung who operate largely using the Android Operating System on their smart phones. Falling ipod and ipad sales. Apple followed their announcement by a live conference call with both Tim Cook and Apple’s Chief Financial Officer Peter Oppenheimer. Despite re-affirming their contentment at the healthy profits, and stating that it was the biggest quarter for profits, outside of the Christmas holiday season, since the company began, some chinks in the armor did appear. Whilst the iphone had increased the profits for Apple, the ipod and the ipad were in the shadows, both declining in sales. Ipad sales were down by a sixth and ipod sales halved from the previous quarter, although the decline in ipod sales has been predicted as the technology becomes absorbed into other portable devices, and the sole technology for digital music players becomes redundant.